When I first saw the title of this book I was rather intrigued as I have a son who has AS who loves cats. So we both sat down to read it together and right from the start we couldn't stop chuckling. The way the author has put the photos together with how Asperger affects the individual is brilliant. We gave it to people who don't really have a great understanding of Asperger Syndrome and it gave them a better insight into what the world is really like for people who have Asperger. Just an Excellent book. -- Communication Magazine, by NAS What an absolutely charming book! Adorable, funny, interesting photographs of cats are combined with simple, accurate information about Asperger Syndrome in this little gem. It is a PERFECT way to introduce Asperger Syndrome to classmates, neighbors, friends, helpers and community at large. This book should be in the home of every family with a loved one on the spectrum. It should NEVER be on a bookshelf. It should be in someone's hands being shared with someone else! -- The MAAP Two books (All Cats Have Asperger Syndrome and All Dogs Have ADHD both by Kathy Hoopmann) that use a novel, photographic approach to exploring the characteristic personality traits of ADHD and Asperger's Syndrome... Must-have titles for parents with children diagnosed with either of these conditions, and also for Special Needs co-ordinators and Inclusion Manager... Both highly recommended. -- ACHUKA children's blog This is a wonderful, insightful resource for helping students and teachers better understand Asperger Syndrome. The author discusses common personality traits of those with Aspergers and desribes those traits in a playful yet serious manner which helps to elicit empathy and understanding. -- Jaime Parker, Librarian, Irving Independent School District, Irving, TX This book is touching, humorous and gives a great insight, and evokes the joys and challenges of raising a child who is different - a child with Autism. It leaves the reader with a sense of the individuality and the wonderful potential of people with Asperger Syndrome. This is such a great picture book which not only expresses the feelings of an Autistic person in a way that children can understand but also for adults as well. Definitely a book for all. -- BFK Books.com They are independent, adventurous and bright but can often leave you utterly bewildered - a description that will have cat-lovers everywhere nodding in agreement. It will also ring a bell for those with friends with Asperger Syndrome. Through the harmony of words and photos, Hoopman's clever sense of humour opens up the world of Asperger to reveal the potential and the individuality that is so often misunderstood. -- Mychild The one thing I notice most about cats, and respect them for, is their independence. It's a funny thing because this is also what I notice about my Aspie friends. In fact, I see this in my own life as well. It's a unique quality that sets us apart from most other humans. Just like cats are not like dogs. I mean we wouldn't want them to be, would we? Kathy's humorous book that highlights the unique qualities of individuals with Asperger's has us "down to a T". -- Wendy Lawson My nine year old Grand-daughter Emma has just been diagnosed with Autism, but to my knowledge has never heard the word Aspergers. I thought that I would read the book to her. After listening up to page 13, she said, "This is a book about my problems not a cats problem at all." I progressed through the book showing her the pictures, which she found highly amusing, and through provoking making comments all along. I myself though that the book should be one that is on all schools bookshelves to introduce to teachers and children into the world of `different' children who have problems that need careful handling. -- Linchpin Journal In her 2006 picture book, Australian author Kathy Hoopmann uses a familiar and beloved subject for many children - cats - to explain and human neurological condition. Some behaviour of children with Asperger's might seem unusual to others their age, but Hoopmann patiently demystifies it. Imagine: an enjoyable didactic book. It's a rare combination, but this creative approach pulls it off. -- Chicken Spaghetti Blog In a heartwarming, playful and endearing way, the author has created a wonderful book that promotes understanding of difference, is positive and hopeful for all. I can't recommend this book enough for parents and children alike, who will get a lot of pleasure reading it together and looking at the pictures. Left on the coffee table for friends and relatives to read would be a great way of increasing their understanding too. -- Connected Illuminated with delightful colour photographs it compares-touchingly and humorously - the characteristics shared by cats and those with Asperger's. An ideal introduction to the world of Asperg. It uses lovely photographs of cats to outline many characteristics of Aspergers, and could be really useful resource to help children(and adults) who don't have Asperger Syndrome to understand the experience of those who do'. -- Learning Support I recommend the children's book called All Cats Have Asperger Syndrome, which was writtern by Kathy Hoopmann. 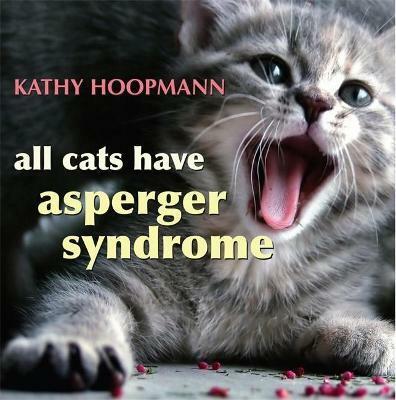 This 72 page Asperger Syndrome (AS) children's book uses text and more than 70 photos of kitty cats to illustrate how these furry and unpredictable creatures reflect AS tendencies and traits. As a person with AS and who owns a cat, I can relate to the premise of the book. -- Roy A. Barnes, Associatedcontent.com All Cats Have Asperger Syndrome is a great addition for the coffeetable for any residence. I would also suggest this for therapist, doctor and school offices. The audience will gain insights through the delightful photographs of cats and kittens in various forms of play and vivid times of distress, alone time and funny mishaps along the way. -- BellaOnline Reviews A warm and understanding approach to the syndrome and those people affected by it. Each page has a beautiful glossy photograph of an endearing kitten or cat doing something a child with Asperger Syndrome might do, such as taking a risk with no idea of the danger he might get into. Accompanying each photo is a short sentence or phrase, explaining how such a child may feel, think or act under certain circumstances. Kathy Hoopmann is an Australian author currently living in Dubai in the United Arab Emirates. With a primary school teaching background, Kathy became intrigued by certain children's unusual traits. After many years of dealing with, and talking to, people with Asperger Syndrome, she has a wonderful insight into the mindset of Aspies. Her sensitivity to their strengths and weaknesses and her passion for bringing understanding of their ways to the general public, and her ability to encapsulate this in her literature, has made Kathy a household name amongst Asperger Syndrome circles. Kathy is the author of thirteen books for children and teenagers which sell widely in Australia, the UK, the US and the Middle East, and her books have been translated into ten languages. To find out more about Kathy and her writing, visit www.kathyhoopmann.com.